All Gerber homes currently listed for sale in Gerber as of 04/23/2019 are shown below. You can change the search criteria at any time by pressing the 'Change Search' button below. If you have any questions or you would like more information about any Gerber homes for sale or other Gerber real estate, please contact us and one of our knowledgeable Gerber REALTORS® would be pleased to assist you. "WHOO WEEE PRETTY AND NEW! HERE IS YOUR SLICE OF COUNTRY PARADISE! 2018 CUSTOM BUILT HOME BOAST MANY UNIQUE FEATURES, VAULTED CEILINGS, RECESSED LIGHTING, STUNNING COUNTRY STYLE KITCHEN WITH GRANITE COUNTER TOPS, STAINLESS APPLIANCES, COPPER FARM STYLE SINK, AND BOASTING A ONE OF A KIND KITCHEN ISLAND WITH STUNNING BUTCHER BLOCK TOP. THE HOME FLOWS NICELY WITH ITS TIMELESS AND OPEN CONCEPT LIVING SPACE THAT REALLY HAS THE OUT WEST FEEL. GENEROUS SIZED MASTER BEDROOM BOAST FEATURES SLIDING BARNWOOD DOOR THAT INTRODUCES YOU TO THE MASTER BATHROOM THAT IS SURE TO PLEASE, BEAUTIFUL TILE WORK AND PEBBLE STONE SHOWER THAT WILL NOT DISAPPOINT. THE DETAILS OF THE HOME ARE IMPRESSIVE, FROM ITS RANCH STYLE WOOD FRAMED DOORS TO ITS CAREFULLY CHOSEN LIGHT FEATURES IT IS A ONE OF A KIND BEAUTY. IT DOES NOT STOP THERE! THERE IS A SECOND HOME (700sqft) THAT FEATURES ONE BEDROOM, ONE BATH, VAULTED CEILINGS, BEAUTIFUL OPEN CONCEPT LIVING AS WELL, PERFECT FOR A MOTHER-IN-LAW UNIT, RENTAL OR EVEN A GUEST HOUSE. JUST UNDER 9 ACRES OF PRIME GROUND THAT IS FENCED FOR YOUR HORSES AND 4-H PROJECTS. SELLER IS FINISHING UP A 45 X 45 BARN THAT WILL SUPPORT YOUR ANIMALS AND YOUR HAY, ITS LARGE SCALE COULD EASILY BE USED AS A WORK SHOP AS WELL. MANY OPTIONS THERE. THIS IS A PRIME LOCATION IN A WELL DESIRED AREA. BRING YOUR FAMILY AND YOUR INLAWS, PLENTY OF ROOM FOR ALL. 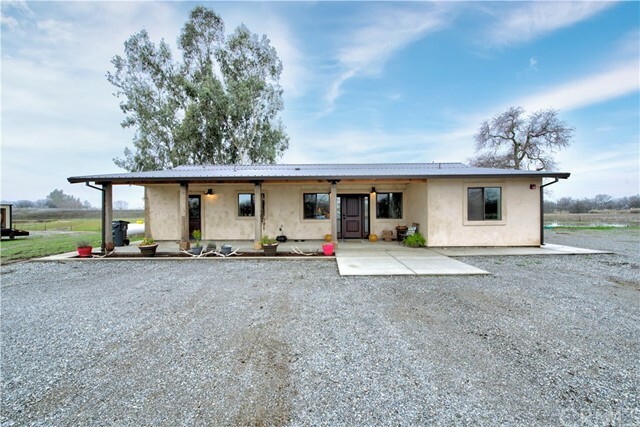 THIS IS COUNTRY LIVING AT ITS FINEST AND JUST MINUTES TO CHICO!!" 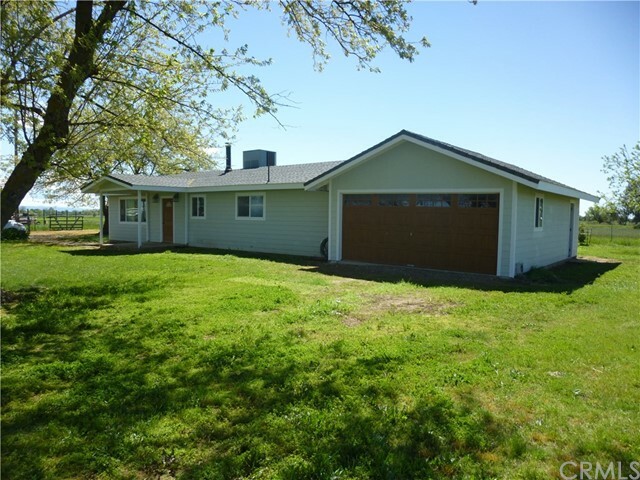 "3/1 bath home on 7.59 acres. This home has had many upgrades. Newer siding, vinyl windows, HVAC, roof is under 8 years old, kitchen cabinets and many other small improvements to make this home more comfortable and appealing. There are two lots adjacent to this acreage. One is 8.66 acres for $94,500 and the other is 7.59 acres with power and a barn (needs work). The owner will look at an offer for the complete acreage with the house. Currently the property is being dry farmed. There is El Camino irrigation available but the buyer would have to investigate."